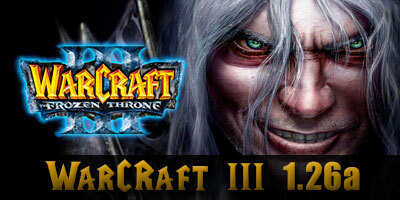 Release patch 1.26a (1.26.0.6401) for warcraft III The Frozen Throne. – Hex will no longer provide a speed boost to a Hero if cast at the end of Metamorphosis or Chemical Rage effects. – Fixed an issue where some Mac patches could lead to disconnections during Battle.net games. – Warcraft III The Frozen Throne any version in English. I.- Run the downloaded file (War3TFT_126a_English.exe) to install it. – to fix registry errors during installation (Registry error loading key Warcraft III\InstallPath), use Warcraft III Setup . – You need to install the file as an administrator (right clicking War3TFT_126a_English.exe and selecting “Run as administrator”).